Wow! 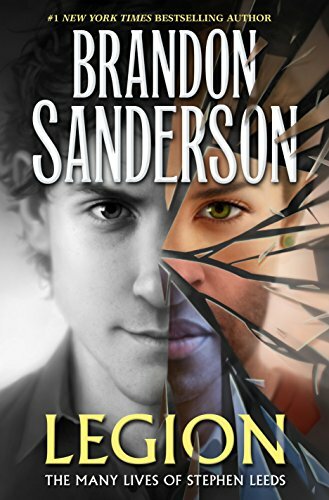 I think Brandon Sanderson has to be insane to even dream up these stories. Perhaps this is an autobiography? 😉 Sanderson is one of my favorite authors, so Legion: The Many Lives of Stephen Leeds was a must-buy. It’s a mind-bending ride with a quite a bit more humor than his usual adult fare. Between the three stories, there’s quite a bit of background and satisfactory resolution of major storylines. I’d not be adverse to more Leeds stories, though. Many consider Stephen Leeds to be insane, but he’d just tell you that all his aspects are how he compartmentalizes knowledge and skills. He’s got forty-something people running around in his head and they’re not him. Well, they are him, but they aren’t. Each is a distinct personality that exists at the same time as each other; Stephen is just the middle manager that makes them behave while they’re helping him on cases. There are three stories included in this collection: Legion, Legion: Skin Deep, and Legion: Lies of the Beholder. In Legion, Stephen has to find a missing camera and the engineer/scientist who designed and stole it. It’s a camera that takes pictures of the past – any time and any place in the past. It could be used to see who killed Kennedy, what was written on secret documents, or if Jesus actually appeared to the disciples after his crucifixion. It could also be used to blackmail people or destroy entire religions. No one would be safe. In the second book, Stephen must find the body of a scientist that has been stolen. It’s got massive amounts of data encrypted in its cells and DNA, as the engineering company the man worked for was inventing a way for the human body to be a data storage and computing device. “Every cell in your body contains seven hundred and fifty megs of data,” the engineer said. “For comparison, one of your fingers holds as much information as the entire internet.” Gives a new meaning to the “thumb” drive. But now there’s a chance the engineer loosed a virus that causes cancer on the world. Can Stephen find the body and the pad to unlock its encryption? In the third story, Leeds is contacted by Sandra, the one who helped him create and stabilize his aspects to maintain his sanity and balance. It’s a cry for help that he can’t ignore. Unfortunately, maybe Sandra or the people she is working with have an ulterior motive. It’s always about the money, and this time the bad guys want Stephen to figure out how to perfect an augmented reality that Sandra’s using to destroy her aspects. Even as Stephen starts losing his own aspects to violence and nightmares, he must keep track of what is real and what isn’t inside his head and outside. It’s a crazy world out there. Twisty mysteries, humorous banter, great insights into the reality of insanity, and just a whole lot of fun. Stephen’s inner dialogues are not only fun, but feel real. You never feel that Stephen is faking, and it’s always clear through all the twists and turns that his inner landscape and its resident population is just as real as the outside world. Loved all the characters, including Stephen’s real life butler. Highly recommended, as I’d recommend anything Sanderson, with the caveat that one sometimes has to wait several years between books. (I’m looking at you, Rhithmatist.) Luckily this collection contains the complete the Legion set. I received a sample of this book (it turned out to be a story I already owned, and not the entire book) as an Advanced Reader Copy (ARC) from the publisher through NetGalley. I bought the complete book on Kindle for myself. My opinions are my own. Legion: The Many Lives of Stephen Leeds includes Legion, Legion: Skin Deepand the brand new, shocking finale to Leeds’ story, Lies of the Beholder.